Simone Young with her baton in Hamburg, Germany. ...So her success, then, is 10 per cent inspiration, 90 per cent perspiration? "Yeah. Otherwise you're just not going to get there." Young's percentages are probably more even than that. The daughter of an Australian schoolteacher-turned-lawyer ("Dad's a very strong man; one day when he was already quite old he just decided to swap careers") and a Croatian-born dressmaker ("Mum struggled to learn English in the 60s; Dad took Croatian evening classes"), her earliest musical memories involve tinkering on an ancient piano at her grandmother's house, aged three. 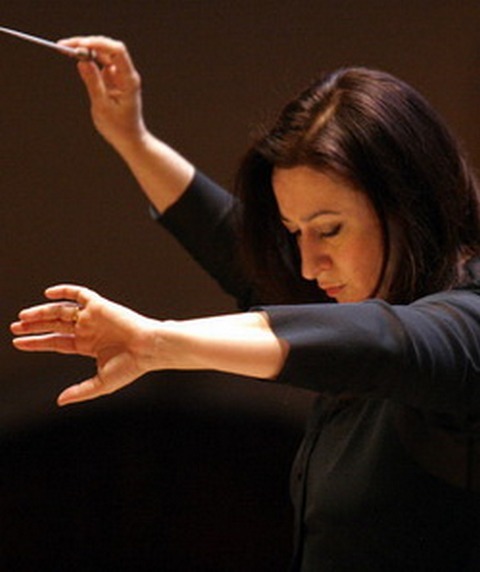 Australian Simone Young was the assistant conductor to Daniel Barenboim. He comments on her qualities. Barenboim observes that the conductor’s right hand maintains the beat and the left hand is used for nuance, colour and phrasing. Her manager, Michael Lewin, recalls his first introduction to Young. Simone Young is seen conducting the opera Tristan and Isolde by Richard Wagner. Conductors Barenboim, Charles Mackerras and Norman Lebrecht author of The Maestro Myth, comment on Young. Conductor Simone Young rehearses, researches and conducts the Richard Wagner opera Tristan and Isolde. This clip shows an orchestra playing and Simone Young conducting a rehearsal of the opera by Richard Wagner, Tristan and Isolde. The whole orchestra is filmed from above and some individual players are shown in close-up. Simone Young instructs the orchestra, who in turn note her instructions on their scores. Two other conductors, Daniel Barenboim (unlabelled in the clip) and Charles Mackerras, and author Norman Lebrecht, speak about the role of the conductor cutting to Simone Young walking backstage holding some flowers. Finally she is interviewed sitting between a piano and piles of scores. 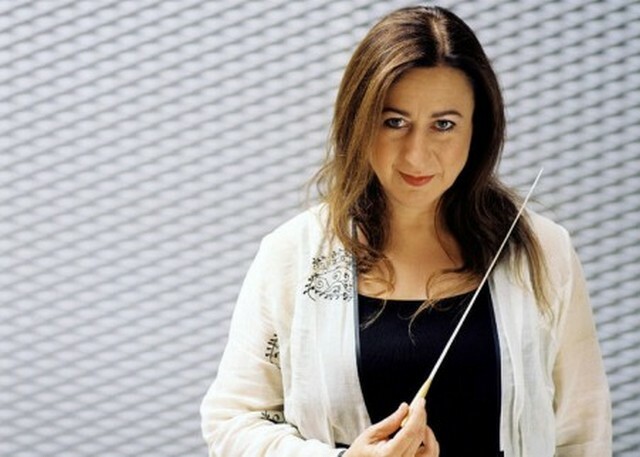 * Australian-born Simone Young (1961–) is a conductor who has succeeded in a highly competitive, male-dominated field. Her career as a conductor was launched at the Sydney Opera House in 1985. She describes her 4 years as assistant to Daniel Barenboim at Bayreuth, in Germany, as being crucial to her career. In 2001 she took up a position as musical director of the Australian Opera and in 2005 she was appointed general director of the Hamburg State Opera and chief conductor of the Philharmonic State Orchestra Hamburg. She has conducted at most of the major opera houses in Europe and the USA. * Young is a pioneer among female conductors. She was the first woman to conduct at the Vienna State Opera and at the Opera Bastille in Paris. She was also the first woman to conduct the Vienna Philharmonic. * Some of the challenges of orchestral conducting are referred to in the clip. In her role as musical director of Opera Australia, Young experienced challenges that she could not overcome. She achieved great critical success and audience support during her tenure and had every expectation that her 3-year contract would be renewed in 2003. However, it was not, causing considerable publicity. It was said at the time that Young’s vision for the musical development of Opera Australia outstripped available finances. * The rehearsal process is the way in which the conductor’s interpretation of the score is transmitted to the musicians and performers. In the clip the music stops and Young gives instructions for how she wants the music to be played. The musicians are shown marking their scores. They replace previous conductors’ interpretations with those of Young. These marks may indicate tempo, tone, or emphasis. They do not alter the music itself but indicate the conductor’s interpretation of it. * Simone Young is seen conducting music by Richard Wagner, in whose work she specialises. She counts most of the Wagner operas in her repertoire of more than 65 operas. Young conducted the complete Ring Cycle of Wagner in Vienna, in October–November 2000. This achievement, combined with her conducting of Tristan and Isolde and Tannhauser for Opera Australia, have gained her great international critical acclaim. * References are made in the clip to the role of gender in the field of classical music. For most of classical music’s history, the 'great’ composers have been male. Despite the success women have achieved as instrumentalists, the Berlin Philharmonic only admitted its first female player in 1980. The Vienna Philharmonic appointed its first female musician in 1997 and in 2004 it had only three women among its 148 members. Even in US, British and Australian orchestras the majority of brass players are male. Globally female conductors are extremely uncommon. * Simone Young refers to the 'boys’ club’ of conductors. According to Norman Lebrecht in his book The Maestro Myth, female conductors have always been given a hard time by male-dominated orchestras. It is only recently that women have taken up careers as conductors, and many have not survived. Around the world, notable female conductors include Sian Edwards in the UK, Jane Glover, who took over the London Mozart Players, and Catherine Comet in the USA. Marin Alsop, in 2005, was the first woman to be appointed chief conductor of a major city symphony orchestra, the Baltimore Symphony, in the USA. * The clip features Sir Charles Mackerras (1925–), one of Australia’s finest conductors. Born in the USA of Australian parents, Mackerras studied in Sydney and Prague. He made his debut as an opera conductor at Sadler’s Wells, and was First Conductor of the Hamburg Opera (1966–69) and Welsh National Opera (1987–92). From 1993 to 1996, Mackerras was Principal Guest Conductor of the San Francisco Opera. His productions of the work of Wolfgang Amadeus Mozart and Leos Janácek have received critical acclaim. Knighted in 1979, Mackerras became the first recipient of the Queen’s Medal for Music in November 2005. * The great pianist and conductor Daniel Barenboim (unlabelled in the clip) is interviewed on the subject of conducting. Like many great conductors, he made his name first as an instrumentalist. A child prodigy, he gave his first official concert as a pianist at the age of 7 years. After a highly successful career as a concert and jazz pianist he made his conducting debut in 1967 with the New Philharmonia Orchestra in London. In 1991 he succeeded Sir George Solti as music director of the Chicago Symphony Orchestra. Many thanks to Mr. Seno Markulin, Sydney, for his impetus to create this web page.